"If Hollywood was Mount Olympus, then Lew Wasserman was Zeus." Outside of the Hollywood film industry and us lovable movie nerds, the name Lew Wasserman may not necessarily ring a bell. But if you were to peel back the glittery, shimmery skin made up of high profile stars and big-budget features you would reveal the deal makers, the movers and shakers who really control the world of entertainment, the folks you don't always hear about but who truly drive what you and I ultimately see when we plop down in a theater or turn on a television, regardless of what celeb of the month has top billing. And Wasserman was at the top of that particular power heap. As the ultimate big cheese at MCA/Universal (and Hollywood), Lew Wasserman wasn't just one of those guys, he was "the" guy, and when he died in 2002 at the age of 89 he left behind a legendary 60 year trail of hustle and flow that made him an omnipotent force to be reckoned with. 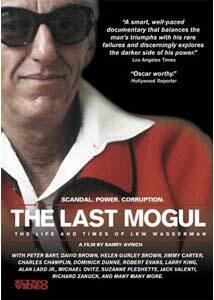 Wasserman's the subject of the doc The Last Mogul from perpetual bio director Barry Avrich (Guilty Pleasure: The Dominick Dunne Story, A Criminal Mind: The Life and Times of Edward Greenspan, Maurice Richard: The Legend, the Story, the Movie). Avrich traces Wasserman's life from his childhood days in Cleveland to his start in the entertainment world as an usher on through his reign as the "most powerful man in Hollywood", a title he earned at age 33 and carried with him for decades. Avrich gathers a smorgasbord of people who knew and/or worked for Wasserman to offer color comments between the narration, ranging from the mainstream famous (Jimmy Carter, Larry King, Suzanne Pleshette) to well-known-to-movie-buffs (Richard Zanuck, David Brown, Michael Ovitz, Sydney Pollack, Robert Evans) as well as an assortment of less recognizable friends, writers, producers. The cumulative effect is a wealth of insider stories that flesh out the life of Wasserman, who according to the opening narration "left no filmed interviews, no memoirs and not one written word". And it's through these interviews that the story unfolds of how Wasserman shaped everything from stars getting a piece of the backend in favor of a lesser salary (James Stewart in 1950s Winchester 73), the secret hand that helped guide Ronald Reagan into power, the license-to-print-money world of the "movie of the week" concept for television and even the advent of the immensely popular Universal studio tour. And that's just scratching the surface. Using a wonderfully nostalgic batch of archival footage and a zippy 1940s-esque nightclub score, Avrich patches together an action-packed timeline that occasionally seems to doubleback on itself, but for the most part trods forward in a rush of lore from Hollywood's golden age on through "modern" films such as Jaws. There's not-so-veiled mob connections and battles with the government over anti-trust issues to give the story its requisite edge, and the remarkably admirable ballbusting "undiluted authority" of Wasserman as the super agent who pulled the strings and moved the chess pieces that we call stars. On tap in massive quantities are deals, money, power and of course the obligatory downward slide (referred to by one interviewee as the "fundamental arc"), which here seems both fitting and brutal. Image Transfer Review: The print quality reveals some nice detail on facial closeups during this 1.85:1 widescreen transfer, but the fact that it's nonanamorphic really just seems unforgivable. Lots of archival footage put to use here, of varying quality, but the present day interviews carry a steady level of natural fleshtones and colors for the duration. But overall points lost just because it's not 16x9 enhanced. For shame. Audio Transfer Review: No issues with the pleasant 2.0 audio track, with Neil Shee's narration and the hipster nightclub score sounding consistently full-bodied. The on-camera interviews sound clear, especially the groovy cool rumble of Robert Evans. The presentation here falls right in line with a slightly better-than-average documentary feel, though it is hardly the kind you'll use as a reference disc. Extras Review: Extras consist of a brief 15 image Photo Gallery of various shots from Wasserman's long career, though no captions or information about the photos is available. The disc itself is cut into 12 chapters. Jack Valenti called Lew Wasserman "Zeus", and there's no question the man was an genuine icon in Hollywood. Barry Avrich's life-and-times doc might be too inside for those who don't really care about the inner machinations and power struggles of the movie industry, but if you're that kind of geek this will be a fascinating look at a man who had his fingers in lots and lots of Hollywood pots. The transfer, however, is inexplicably nonanamorphic, and we all know how volatile of a subject that can be. An easy recommendation for movie geeks.